Allyn Cox Oil on Canvas 1973-1974 Great Experiment Hall Cox Corridors Meeting in New York at Federal Hall, the first federal Congress initiated the committee system, levied taxes and imposts, and enacted a judicial system. The Senate exercised its powers of advice and consent. Most important, the Congress passed the first ten amendments to the Constitution, which became known as the Bill of Rights. 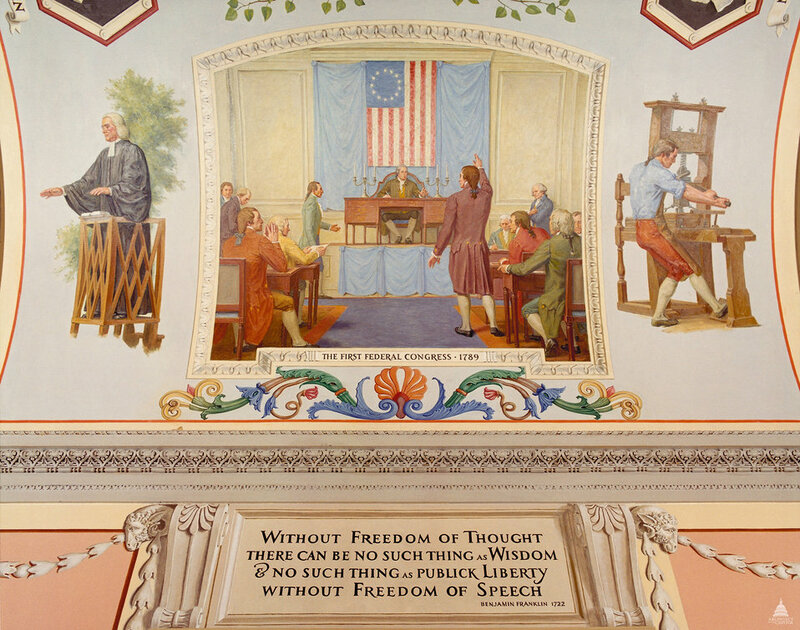 Shown in the mural are (from left to right) James Madison (standing), speaker Frederick Muhlenberg (seated), Elbridge Gerry (standing, foreground), and Fisher Ames (standing, rear). Left: A preacher conducts an open-air service, symbolizing the freedom of religion that is assured by the First Amendment to the Constitution. Right: A printer at work represents another First Amendment right, freedom of the press. This official Architect of the Capitol photograph is being made available for educational, scholarly, news or personal purposes (not advertising or any other commercial use). When any of these images is used the photographic credit line should read âArchitect of the Capitol.â These images may not be used in any way that would imply endorsement by the Architect of the Capitol or the United States Congress of a product, service or point of view. For more information visit www.aoc.gov.